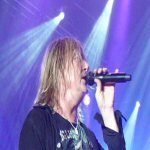 Joe Elliott commented on tomorrow's Def Leppard/KISS tour announcement on his Planet Rock radio show last night. Joe said the upcoming tour is the "Worst kept secret in rock and roll." at the start of his show. He mentioned the event again at the end confirming the whole band will be in attendance. Both band's will announce the "2014 Heroes Tour" at the House Of Blues in Los Angeles tomorrow at 11am PT/2pm ET - (6pm UK). The press conference / Q&A will be streamed live at Live Nation's website. "And I have to add things are hotting up big time in Leppard land right now. I can't say any more than that. It is the worst kept secret in rock and roll, if you peruse the websites around the world - the rock websites. But stay tuned if you're in UK time, late evening on Monday there's gonna be an announcement made and I dare say it will be on the Planet Rock website also. I can't say any more than that." "I'm off to Los Angeles for a few days for the big press announcement with the rest of the Leppard guys and a few other people that I'm sure that you've heard of. You'll read all about it next week. We shall talk all about it next week which is in the future."